I’ve battled with thin, lifeless hair for so long. It never grows past a certain length and after years of bleaching it (with plans to go even more blonde this week) it is extremely damaged. I have hunted for products to perform miracles and as of yet, nothing has helped. 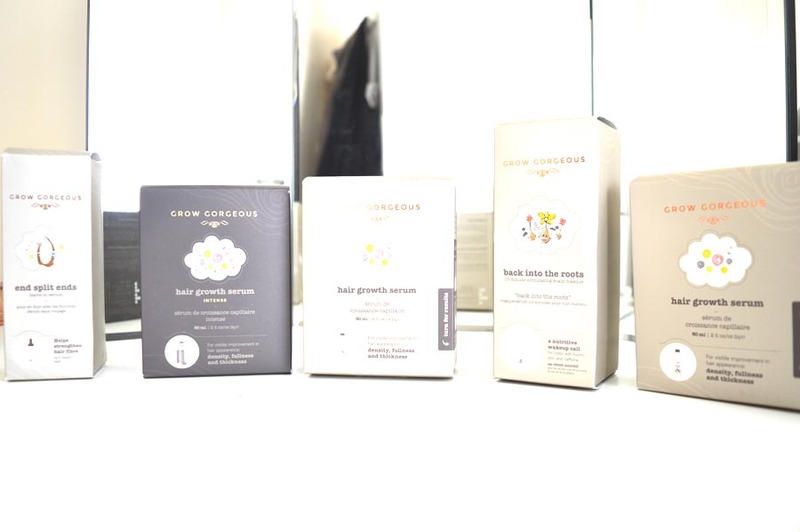 When Grow Gorgeous got in touch to try out their hair care needless to say I was incredibly excited, I’ve seen their products on Look Fantastic before and was curious. 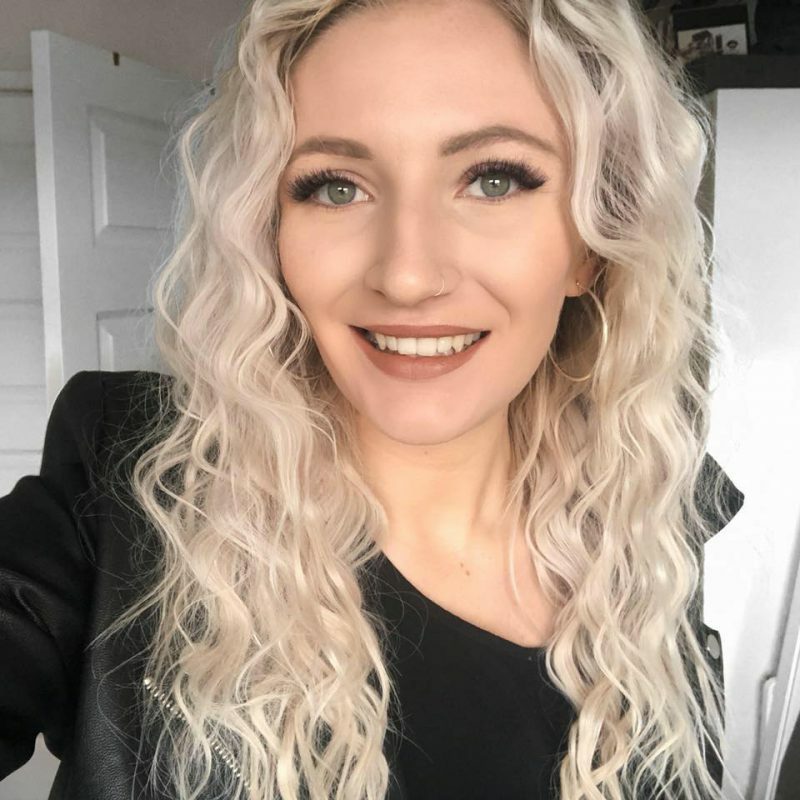 I’m currently trying out to see if they will help my hair to grow and strengthen with their help and I thought I’d keep you all updated on how I’m finding them as I know lots of you are in a similar position and are on the hunt for gorgeous hair. I was overwhelmed at the amount of products sent my way, I received the end split ends, hair growth serum (x2), hair growth serum intense and back into the roots. So far, I have been using one of the split end serums and back to the roots habitually, but as recommended, to see results. I use up to 20 drops of the hair growth serum daily (which you can carefully control through the pipette included) and have been for the pas few weeks. It’s really easy to use and gets absorbed by your hair instantly without leaving any wet, greasy or stiff residue; think water for your hair. I normally use this of a morning before I go to work and it is said a bottle should last me about two months which looks about right for how long I’ve been using it and how much is gone already. Next up is back into the roots, this is a hair mask that includes caffeine to help stimulate hair growth. It recommends leaving it on for at least 10 minutes, I often leave it an hour at the minimum if not more for optimum results. It is extremely cooling and feels very luxurious. With this, I can feel my hair absorbing the product which makes me believe it’s working. 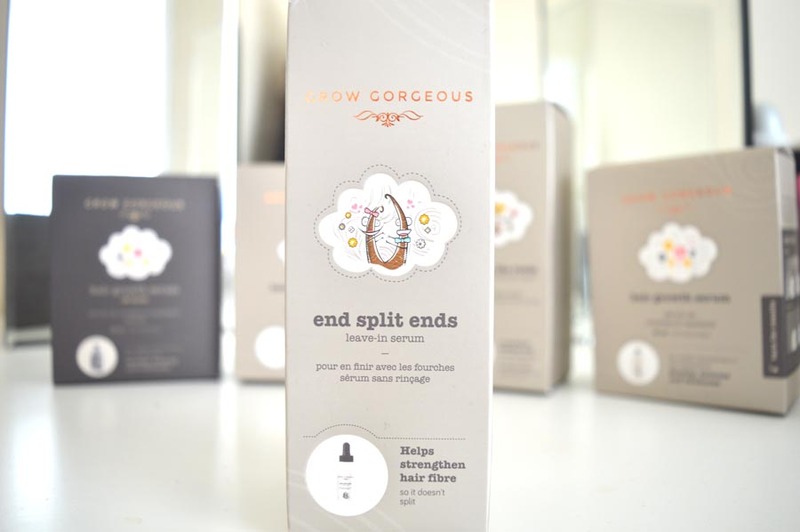 End split ends leave-in serum. I have yet to try this Grow Gorgeous leave-in treatment but I will be as soon as I get my refreshed hair on Thursday. Split ends are the bain of my life and I’ll try anything to help preserve my hair from breaking and appear healthier. Not only that, this product also promises to help hair that is exposed to heat styling frequently. It sounds very interesting and I can’t wait to report back on how it performs. 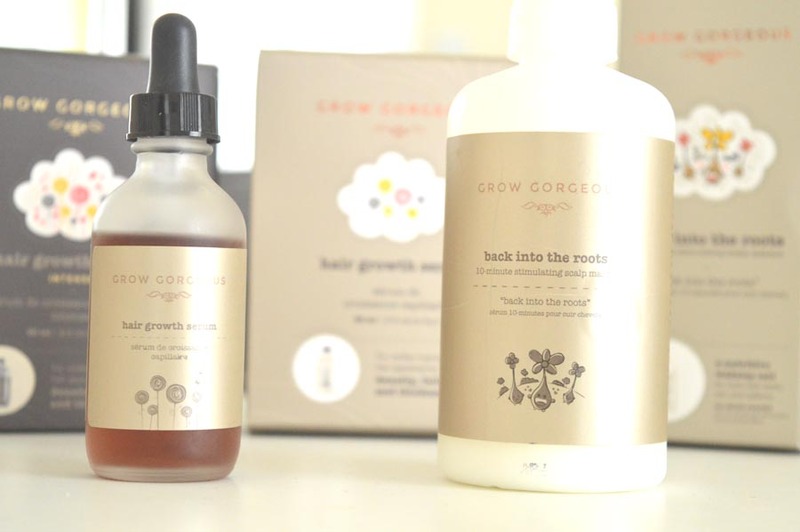 This is the Grow Gorgeous product I’ve been trying out and have taken before shots in anticipation to show you if the product really works. Not only does this encourage hair growth but also promises to condition hair with a range of scientific products including Hyaluronic Acid, Bio-Active Pea Sprout Complex, Bio-Active Complex of Chinese Skullcap, Soy Sprout, Wheat Sprout as well as lots of other natural ingredients I know nothing about but sound fancy enough to perform miracles. Lets hope. This is a more intense version of the previous, with a higher intensity of ingredients to encourage hair growth and fullness. 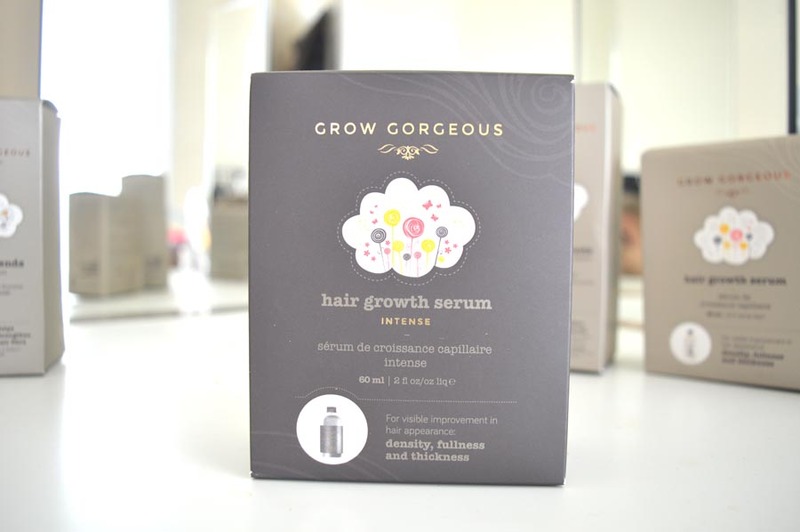 What caught my attention was the claim of this product that “within two weeks hair growth will improve by 78%.” Can you believe that is possible? I really hope so! 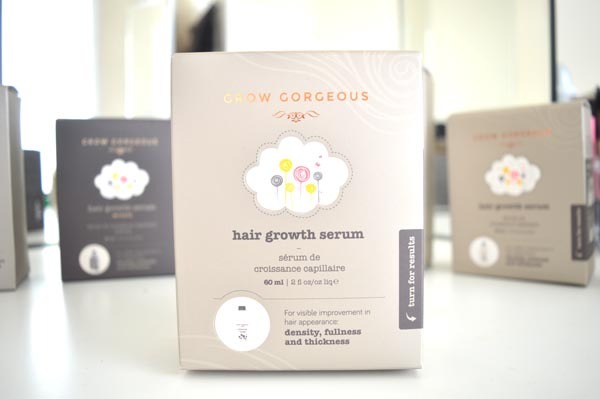 I have already been loving this Grow Gorgeous product so far. I’ve been using it twice a week and love the effect it gives my otherwise flat and lifeless hair. This promises to give hair that looks limp circulation to provide lift at your roots to look big and bouncy; this is something my hair has never had. Since use it has felt much more voluminous hair without having a blow dry. I’ll keep you updated on the progression of my hair growth and health whilst using these over the next few months. I’d love to know if you’d rather a blog post or a YouTube video about these in more depth later down the lane. Let me know in the comments! 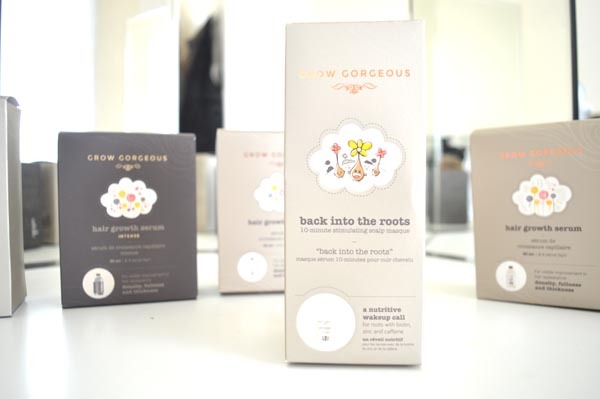 Have you ever tried these grow Gorgeous products before? What are your tips and tricks to achieve fuller and longer hair?